Shares in British drugs firm Phytopharm have slumped by as much as 22%, as investors feared attacks from animal-rights militants. Canaccord Capital has quit as broker to the firm, after one of its bosses was the target of an incendiary device. A website connected to the Animal Liberation Front (ALF) said activists planted the device in May. Activists want Phytopharm to cut links with Huntingdon Life Sciences (HLS), a prominent target of their campaigns. Research firm HLS moved its headquarters to the US in 2001 after a sometimes violent campaign against its staff and property in the UK. Phytopharm said it regretted Canaccord's decision to quit as its broker. The drugs firm said it had previously been the target of attacks by animal-rights militants. Phytopharm's Cambridgeshire headquarters were broken into twice last year. The company said it was forced to take out an injunction against activists linked to campaigns against HLS. "We are concerned it might happen again and we will take as many precautions as we can within the law," Phytopharm's chief financial officer Wang Chong told BBC News. The company, which does not operate its own laboratories, said it outsourced all animal experimental work linked to its products. 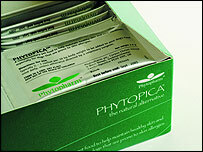 Phytopharm's drugs include treatments for neurodegeneration and obesity diseases. Animal-rights website Bite Back said militants planted an incendiary device under the car of a Canaccord director on 19 May. "The ALF estimates that this device blew his car up," anonymous sources on the website said. "Phytopharm get out of HLS or see your share price crash and your supporters' property go up in flames," a message on the website continued. Mr Chong said staff were concerned at the firm's drop in share price, but added that morale at the company remained high. Canaccord Capital, a Canadian company which also operates in Britain, declined to comment.